Accent your dining table with this beautiful arm chair. The coastal traditional design features a tall curved slat backrest with a curved back top rail for support. The cream fabric upholstered seat cushions contrast charmingly with the rich hand-rubbed patina finish to complete the style. 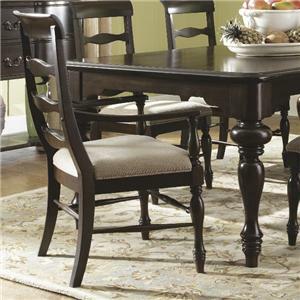 Pair with the matching side chairs and dining table for the complete set. This impressive dresser boasts timeless traditional style with a coastal spin. Crafted from Cherry Veneer and solid Indonesian Mahogany in a rich, hand-rubbed patina with distressed effects to imbue a weathered, natural look and feel. Three over hanging top drawers with round knobs and seven large drawers with bail handles provide ample storage space for clothing, intimates, and jewelry. Finished with turned side posts and feet to complete the beautiful style. Pair with the matching landscape mirror for the complete set. 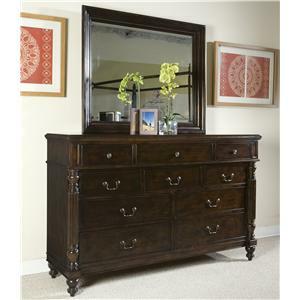 Organize all of your bedroom accessories within this rich, beautiful dresser and mirror set. Nine storage drawers with large custom bar pulls provide ample space for clothing, intimates, and jewelry. Crafted from Acacia Veneer and Indonesian Mahogany solids with a warm distressed brown finish for a coastal, weathered look. 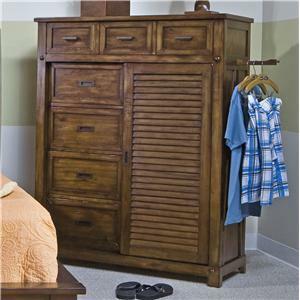 This charming sliding door chest is the perfect piece for any bedroom. Seven storage drawers and a large sliding door with interior storage provides ample space for folded or hanging clothing. Featuring easy-to-grab custom hardware and a slatted door front in a distressed warm brown finish for a unique coastal effect. 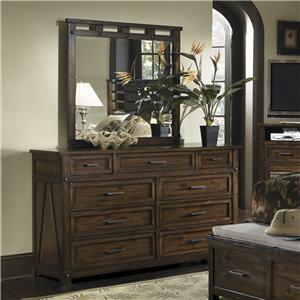 This impressive dresser and mirror set boasts timeless traditional style with a coastal spin. Crafted from Cherry Veneer and solid Indonesian Mahogany in a rich, hand-rubbed patina with distressed effects to imbue a weathered, natural look and feel. Three over hanging top drawers with round knobs and seven large drawers with bail handles provide ample storage space for clothing, intimates, and jewelry. The large landscape mirror features an elegantly moulded frame and beaded trim. 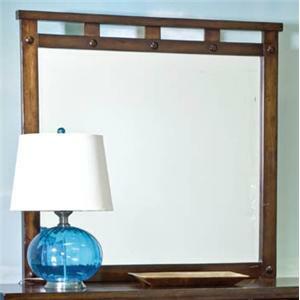 This simple mirror will bring a touch of coastal style to your child's bedroom. The Acacia Veneer and Indonesian Mahogany solid wood frame is finished in a warm distressed brown with large decorative faux plugs. Pair with the matching youth dresser for the complete set. Accent your bedside with this charming coastal nightstand. Three storage drawers are perfect for storing bedside accessories with large, easy to grab custom bar pulls. 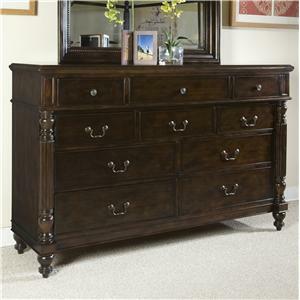 Crafted with beautiful Acacia Veneer and Indonesian Mahogany solids in a warm distressed brown finish. 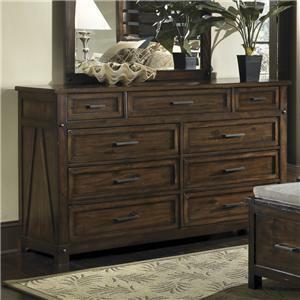 Organize all of your bedroom accessories within this rich, beautiful dresser. Nine storage drawers with large custom bar pulls provide ample space for clothing, intimates, and jewelry. Crafted from Acacia Veneer and Indonesian Mahogany solids with a warm distressed brown finish for a coastal, weathered look. Pair with the matching mirror for the complete set. 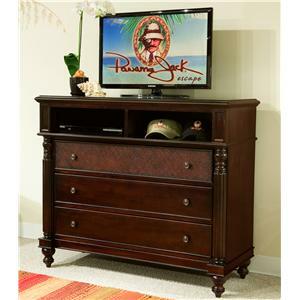 Organize all of your entertainment accessories with this large media chest. Featuring a beautiful traditional style in turned side posts, feet, and round knobs with coastal flair in the decorative accent drawer front. Two open shelves and three large storage drawers provide ample space for electronics and media components. Finished in a rich hand-rubbed patina with distressed effects for a time-worn look and feel. 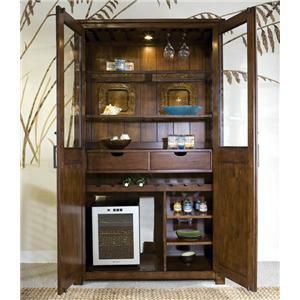 Enjoy plenty of storage in your dining area with this china display. Two large doors feature glass fronts to proudly display dishware on top and slatted wood detailing on the bottom to create a fresh, coastal style. Interior storage space includes spacious shelves, two cubby drawers, and bottle storage to easily organize all dining accessories. 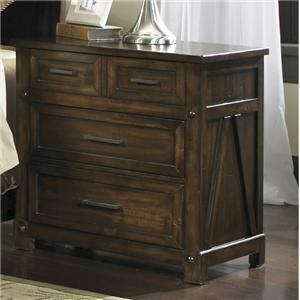 Crafted from Acacia Veneer and solid Indonesian Mahogany in a warm distressed brown.